JJC NS-M1 Series Professional Neck Strap is designed for mirrorless or DSLR cameras with two strap eyelets. The neck strap is made of comfortable and durable Neoprene. It evenly distributes the weight of your camera thereby minimizing strain on back, neck and muscles. Its rugged interior surface prevents the strap from going around when you are shooting. The anti-clip exterior surface constructed from breathable fabric provides better heat dissipation. For mirrorless camera from Fujifilm and Olympus, two camera strap rings and lug protectors are included in the package for attaching neck strap to the camera eyelets. With the two buckles on the strap, you can quickly adjust the strap to your comfort and shooting style. 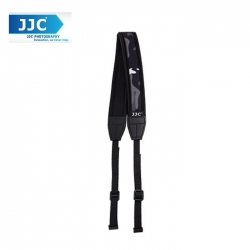 Additionally, JJC NS-M1 Series Professional Neck Straps are available in six different colors. All the features of the strap make it an ideal tool for you to take photos constantly for a long time.